I'm looking for a variation on the \odot (a circled dot) and \oplus (a circled plus) operators, but for the inequality relations. In other words, I'm looking for the symbol to substitute for the blank in the second printed line of following example. I couldn't find any matching symbol using detexify. We can make the circle match the \oplus one by suitable scaling. 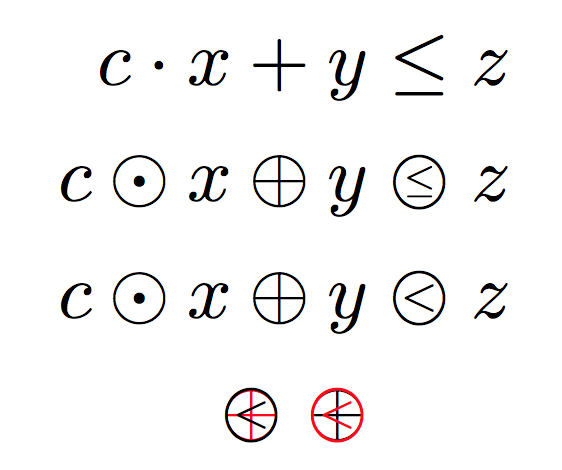 The symbol to be circled has to be scaled depending on its size, so \ogeneric provides for an optional argument (default 0.7 that seems good for <). Note that color is just for the last line where \ole is superimposed to \oplus in order to see they match. The defined symbols can be used also in subscripts and superscripts and they scale properly. You can certainly do this in many ways, one of them is TikZ. 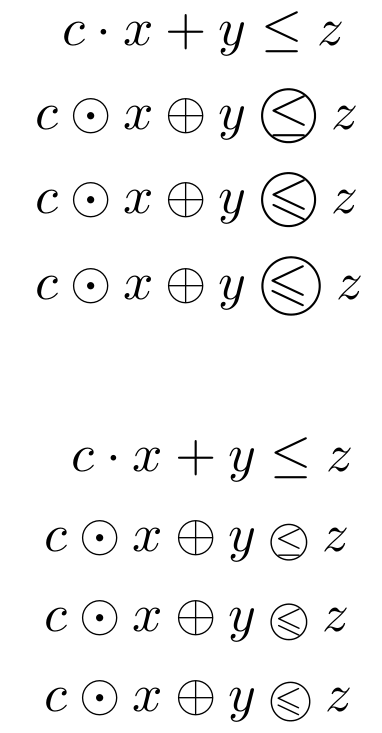 Loading TikZ only for that may be a bit of an overkill, but if you want to construct more symbols of this sort, this might be one of the easiest ways to go. 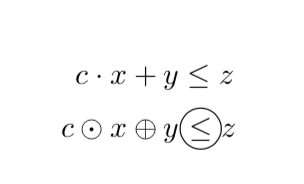 How to get the covering relation symbol?